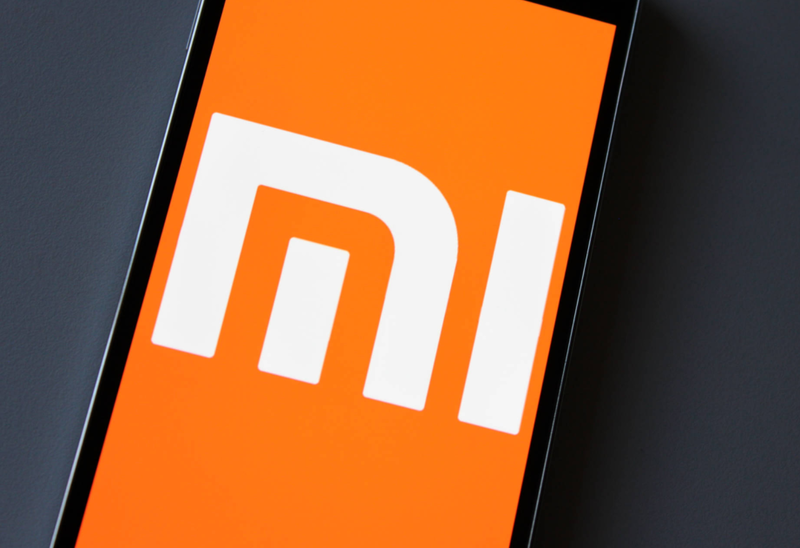 Although we do not usually cover Xiaomi firmware, I have noticed that a large number of our readers also have shown some interest towards certain Specific Xiaomi devices. One of the most frustrating things about Xiaomi phones and tablets is the fact that the company often takes forever to update their smartphones and this year's Android Nougat wasn't an exception to that rule either. However, the good news is that thanks to GizmoChina, we have a list of Xiaomi devices today that will be getting the update to Android Nougat, albeit much later than expected. Strangely enough, the hugely popular Redmi Note 4 and the budget Redmi 4 are not included in this list! It would be interesting to see if they are included later on or if they get a direct upgrade to Android O.
Samsung Galaxy S6 and Galaxy S6 Edge will be launching very soon in the Middle-East region later this month. 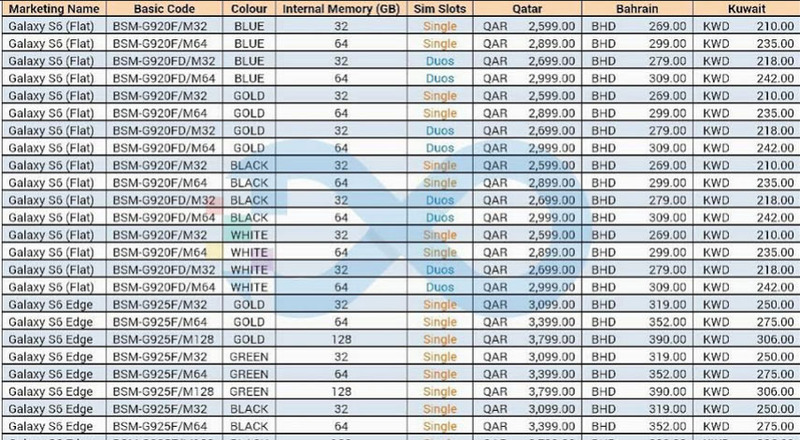 The flagships prices has been leaked in a list that includes all variants of both devices in Bahrain, Qatar and Kuwait. Here's the prices list. Let's start with the Samsung Galaxy S6 single SIM model. With 32GB of native storage, the phone is priced at the equivalent of $714 USD in both Qatar and Bahrain. In Kuwait, it will be priced at $699 USD. The 64GB version is priced in Qatar at $796 USD. In Bahrain, it will be priced at $793 USD and is $10 USD cheaper in Kuwait. The dual SIM 32GB model will cost $741 USD in Qatar and Bahrain, and $726 in Kuwait. The 64GB with dual SIM capabilities will run you $824 (Qatar), $820 (Bahrain) and $806 (Kuwait). The Samsung Galaxy S6 Edge is priced in Qatar at the equivalent of $851 USD, $933 USD and $1043 USD for the 32GB, 64GB and 128GB models respectively. The same models are tagged at $846 USD, $934 USD and $1034 USD in Bahrain. In Kuwait, the Samsung Galaxy S6 edge is priced at $833 USD (32GB), $916 USD (64GB) and $1019 USD (128GB). Samsung only managed to secure a meagre 13% of the global smartphone market's total operating profit, while Apple managed to scoop up 83.4% in Q1 2017! In spite of Samsung outselling Apple globally by millions of handsets in the quarter, they only managed to show an operating profit of $1.57 billion, while Apple posted a figure of $10.1 billion for the same. 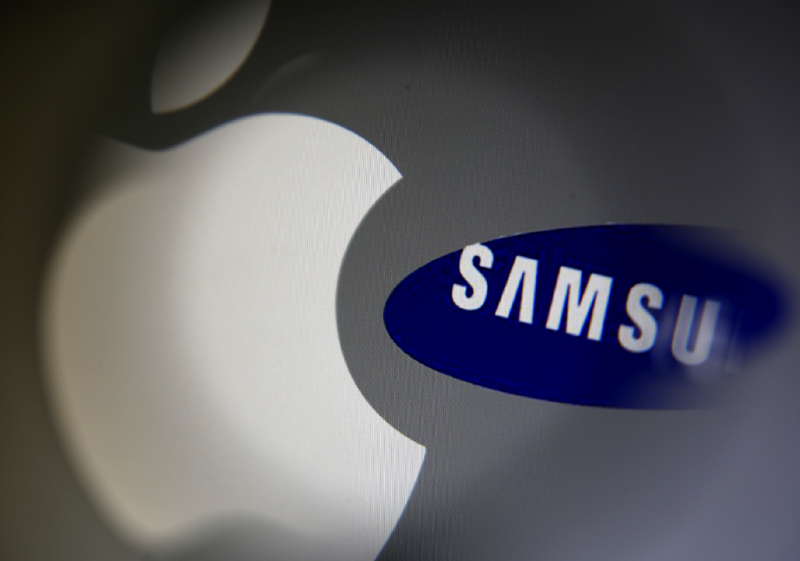 Samsung experienced a 21.9% decline while Apple saw a 79.8% increase in their respective operating profits. If you are wondering how it's possible, well, the answer is quite simple really; higher profit margins. Apple enjoys insane profit margins in the range of 30.7%; something that can only be pulled off by Apple because of its brand name. No other company, including Samsung can afford to sell their smartphones with a profit margin that high because no one would buy them. Apple on the other hand knows that people will continue to buy them, irrespective of the price. Samsung is having trouble holding onto even a 9.7% average profit margin due to steep competition from Chinese manufacturers in the low-mid end segment. 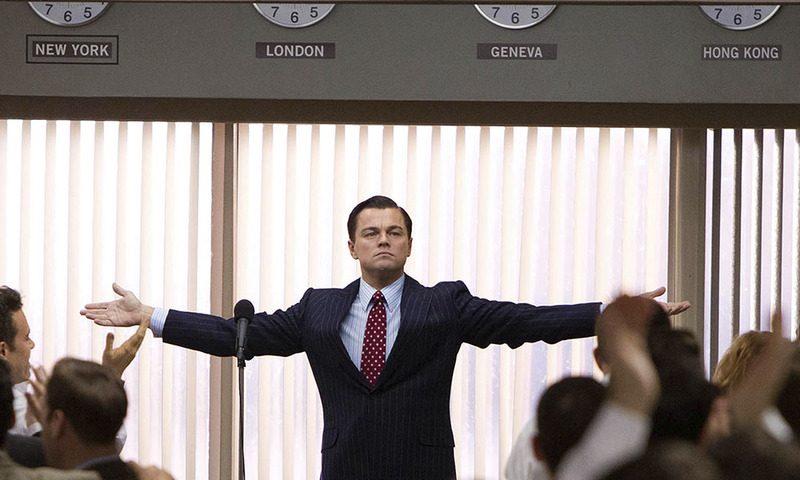 As 2014 draws to a close, it's time for us to look back on another year's worth of gratuitous movie pirating. And surprisingly enough, this year's most torrented movies weren't actually all that terrible. You've got taste, ya thieves. Having an Internet access while flying is important to stay online while flying, either for work or just entertainment. Many major airlines now offer internet access to their passengers through an on-board Wi-Fi connection. Data is delivered via satellites or from ground-based cellular antennas beaming 3G/4G airwaves at the sky. However, its very expensive, starting from $30 per flight. • Norwegian Airlines: has high-speed broadband on flights within Europe. The service is available on the company's Boeing 737-800 aircrafts. • JetBlue: has all of its Airbus 321s and most of its A320 planes equipped with Wi-Fi gear. There's a catch, however. The free access option imposes restrictions on your connection. To go online at full speed, you'll have to buy a pass. • Hongkong Airlines: has free Wi-Fi on its Airbus A330-200 aircraft operating from London to Hong Kong. The connection speed, however, is limited for those using a free pass. • Air China: free Wi-Fi service comes with a catch. Passengers cannot connect to it from their smartphones as these are not allowed to be on during flights. Tablets and laptops, on the other hand, are A-OK.
• Nok Air: provides free Wi-Fi internet access on domestic flights throughout Thailand. The service is only available on two aircrafts, however. Good News! 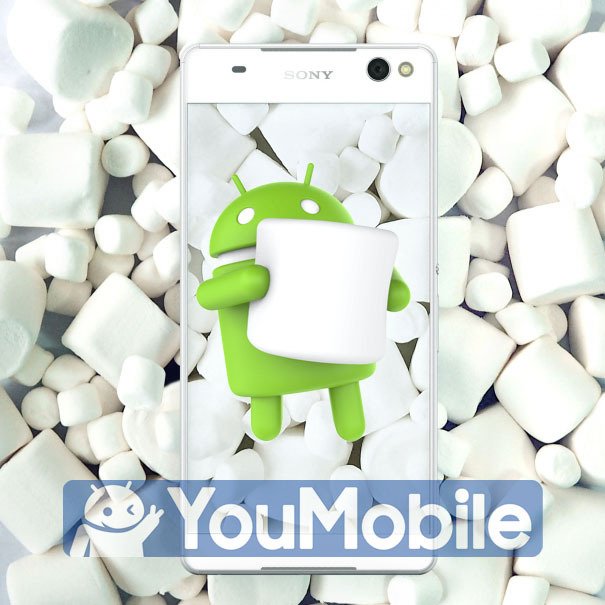 Sony has Officially released a list of all its Xperia devices that has been confirmed to receive the Android 6.0 Marshmallow update. The update will be available as Over-the-air (OTA), However, The company didn't provide a specific time for the roll-out yet but Sony users should expect it by early next year... depending on their market/region. Android 5.0 Lollipop Final version is coming Later This Month, Google already released the SDK 5.0 along with Lollipop Final Source code few days ago and Now all manufactures is preparing to update their devices and many of them already announced that they will update some of their latest flagships with Android 5.0 / 5.0.1 / 5.0.2 Lollipop. 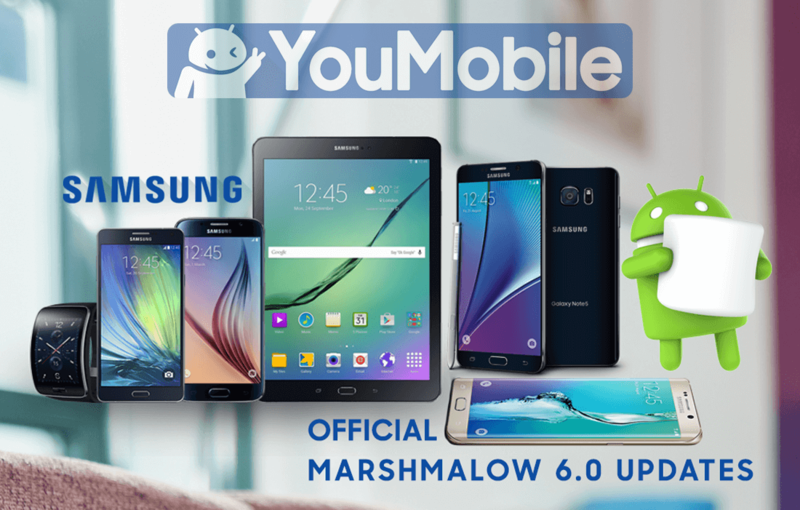 YouMobile Gathered all the confirmed devices that will get Android 5.0 Lollipop update in one list, We are Regularly Updating this List and Adding new devices once we got a confirmation from the manufacture that this device will get the update or already got it. 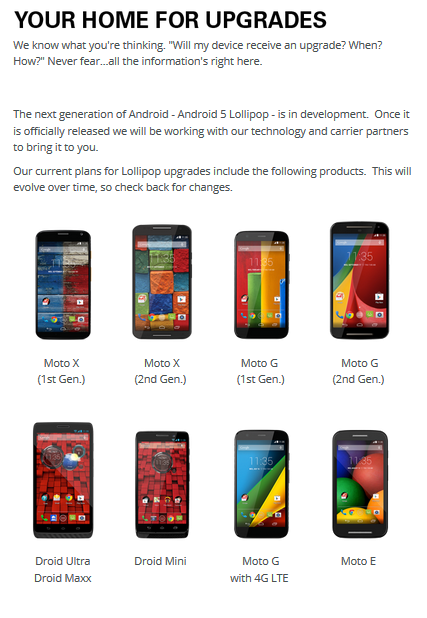 Motorola already have a Lollipop Star on the Nexus world, the Nexus 6. However, the company will update most of its latest smartphones models to Android 5.0 Lollipop. 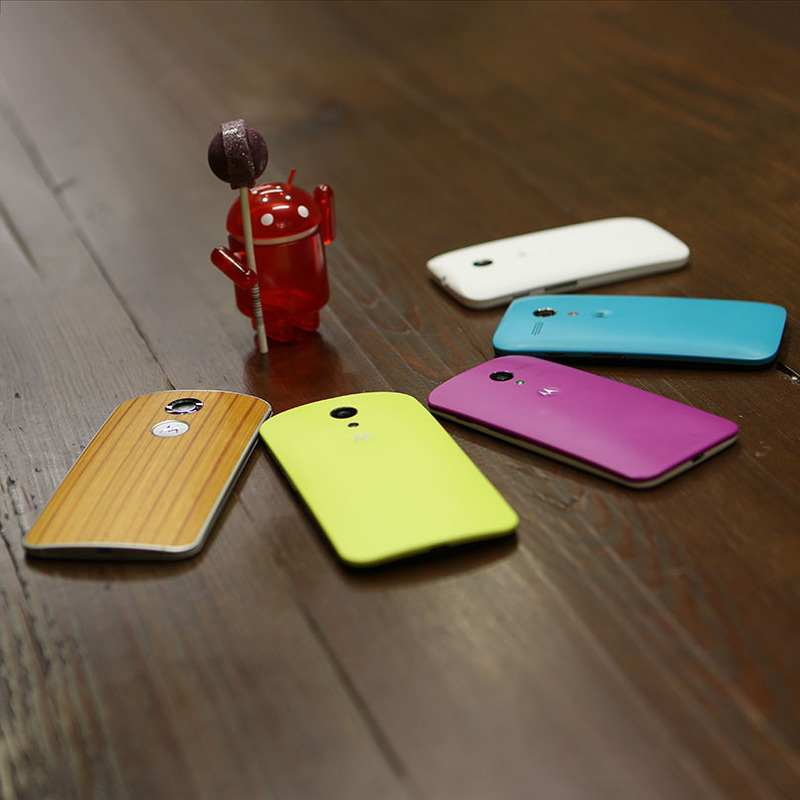 Today, Motorola announced its list of Devices that will get the Lollipop update. If your Motorola smartphone was not updated to Jellybean, what on God's Earth would make you think that it will receive Android 5.0? Similarly, you can rule out models that failed to taste the chocolat goodness of Android 4.4 KiKat. Currently, Motorola models due to receive Android 5.0 Lollipop include the Motorola Moto X (both 2013 and 2014 models), the Motorola Moto G (both 2013 and 2014 models), Motorola DROID Ultra, Motorola DROID MAXX, Motorola DROID Mini, Motorola Moto G LTE, and the Motorola Moto E.
Most of the Google Nexus devices is expected to get the Marshmallow update officially through a system Image, which comes first always, or via Over-the-air (OTA) update which will start rolling-out by Early October. Here's the a list of all Confirmed Google Nexus devices that will get Android 6.0 Marshmallow update. 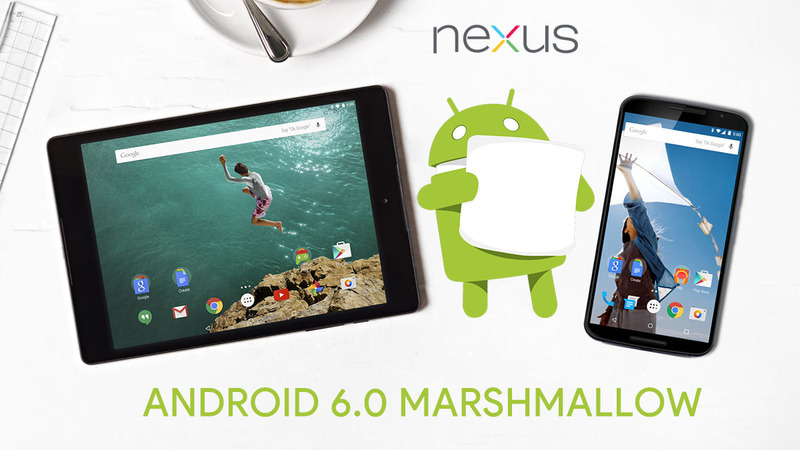 Please Note: Nexus 10 (mantaray) and the Nexus 4 (occam) will not be moving to Marshmallow. 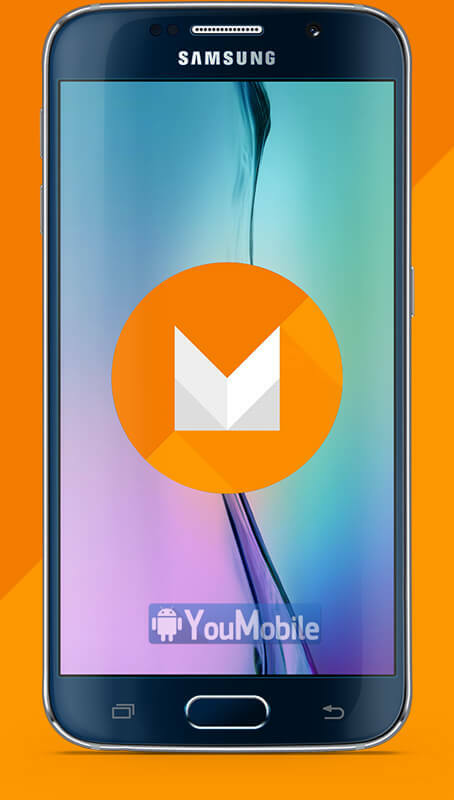 The Marshmallow Nexus Images will will be available for Download Here by Early October. Check What's new in Marshmallow 6.0 release to see a detailed change-log and a list of all the new features that will be included in the final release, OR follow our LIVE! updates Page to stay up-to-date. Stay tuned! 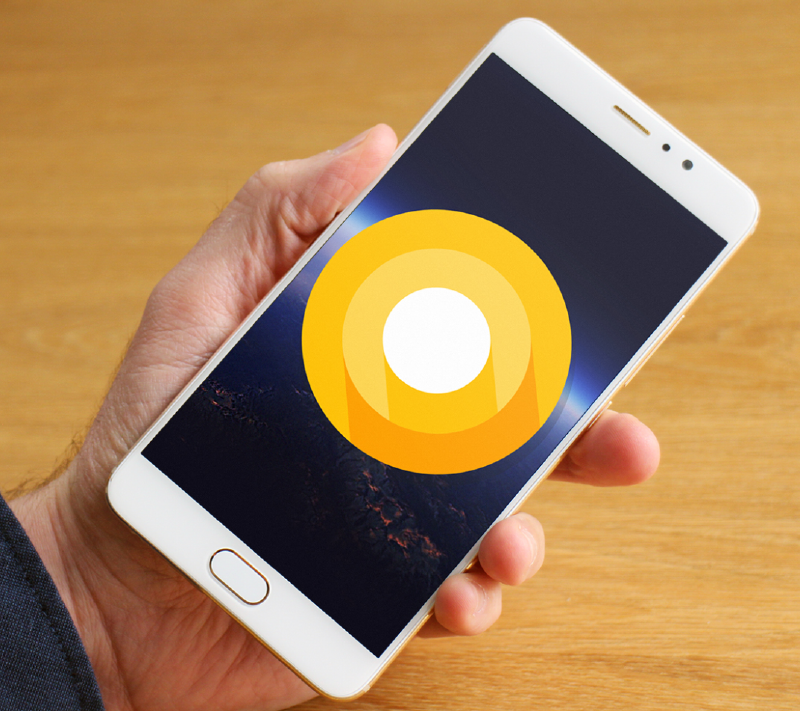 Thanks to SamMobile and their expert analysis, we have for you today, a complete list of Samsung devices which are most likely to get the Android O update officially from Samsung. Keep in mind though, it's too early to state the timeline for any of these devices yet. While this is by no means a confirmed list, it looks pretty sound at the moment. Sony has officially announced the official list of the Xperia Devices that will get Android 5.1 Lollipop OTA updates in the upcoming months, officially. The list includes high-end devices from Xperia Z3, Z2 and Z family along with some mid-range devices too. 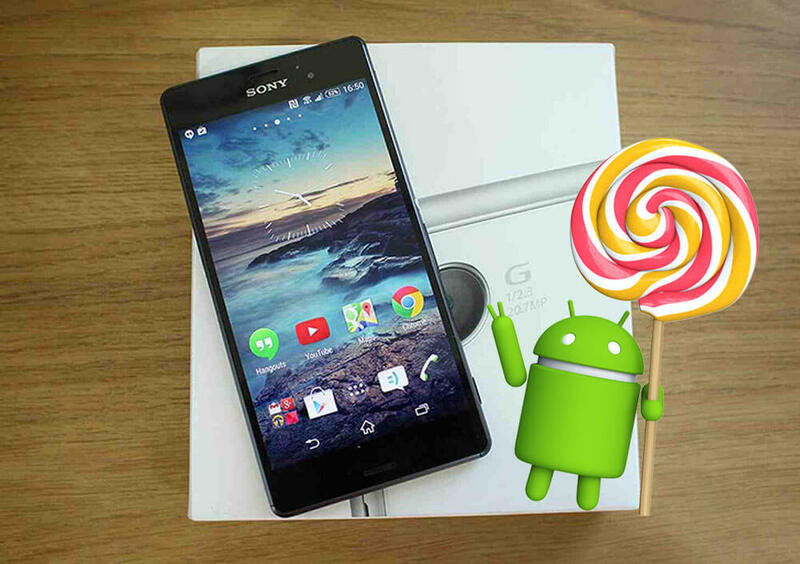 Android 5.1 Lollipop is currently In-development for lots of Xperia devices and it is scheduled for a July release. The dual SIM flavors of the devices above will be treated with the same update as well. 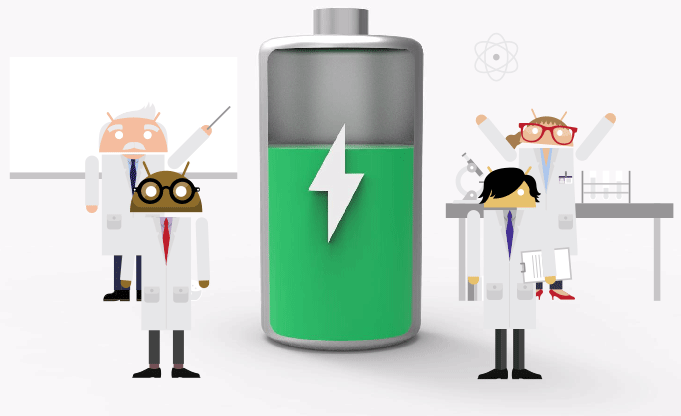 Google published Android Lollipop's new Android 5.0.1 version with bug fixes. But still Android Lollipop have lots of bugs. Here is the list of all Android 5.0.1 Lollipop problems in the aftermath of the update's release. Android 5.0.1 Lollipop is small bug fix update from Google. 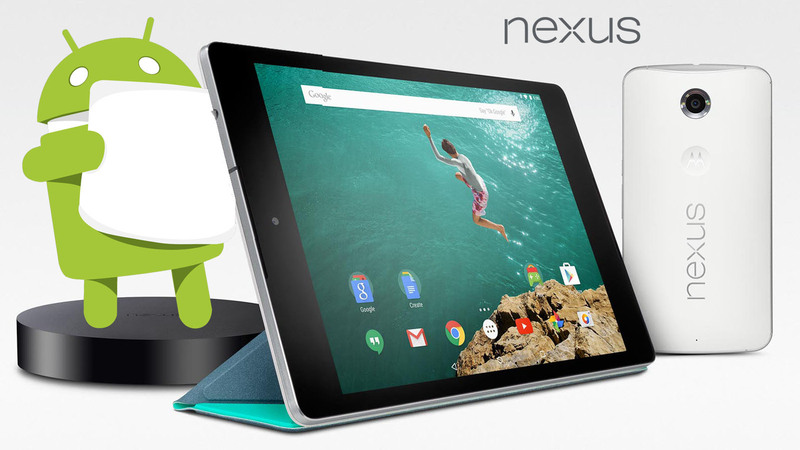 Currently rolling out to owners of select Nexus devices including the Nexus 4, Nexus 7, Nexus 10, and Nexus 9. The update's goal is to shore up the experiences on these devices and stabilize them as we head into the new year. We haven't noticed any system wide bugs and most of the Android 5.0.1 problems that we're seeing, so far, are both small and isolated. Still, there do appear to be problems. - Inability to connect to wireless at work, screen rotation issues on the Nexus 7, various issues with Wi-Fi after installing Android 5.0.1, Android 5.0.1 installation issues. - Problems with Google's "OK Google" function. - Wi-Fi connectivity problems and security issues. - Issues with sound after upgrading. - Problems with the home button. - Reports about Notifications disappear without tapping them. Not everyone is dealing with Android 5.0.1 bugs, at least not yet. We've heard from numerous Nexus users, of all shapes and sizes, who claim that Android 5.0.1 Lollipop is treating their device well. Our Android 5.0.1 experience on the Nexus 7 2013 has been outstanding and its performing well in key areas like battery life, Wi-Fi, and overall speed. Samsung has announced before exclusively through our blog that it will update most of its devices to Google's latest Android 6.0 Marshmallow release. Google has officially released the final version of Android 6.0.1 Marshmallow OTA updates earlier this month. Today, After collecting all of our internal information we are glad to announce the official list of Samsung Galaxy devices that will receive the Android 6.0 Marshmallow update officially with an ETA (Estimated Time of Arrival) dates. - Please Note, these dates are "Estimated", so it can be changed at any give time, we will keep this list always updated with new ETA dates or adding New confirmed devices. The Korean giant is still evaluating the Marshmallow 6.0.1 updates on some of its current mid-range devices, due to lower hardware performance and limited memory than High-end flagship devices. We will add any samsung Galaxy mid-range devices from the (E, A, J.. etc) family once we get a confirmation about them. What's New on Samsung's 6.0.1 updates ? Samsung Android 6.0.1 Marshmallow major updates will be rolling-out by the Early,2016 Over-the-air (OTA). The update will include a New TouchWiz UI with more Material Design, improved security, improved internet experience, better app permissions control, updated notification panel, updated system apps, HUGE improvements in the battery life, Redesigned App Drawer, minor UI changes along with various bug fixes and performance improvements. We've got some Great News for Samsung users. 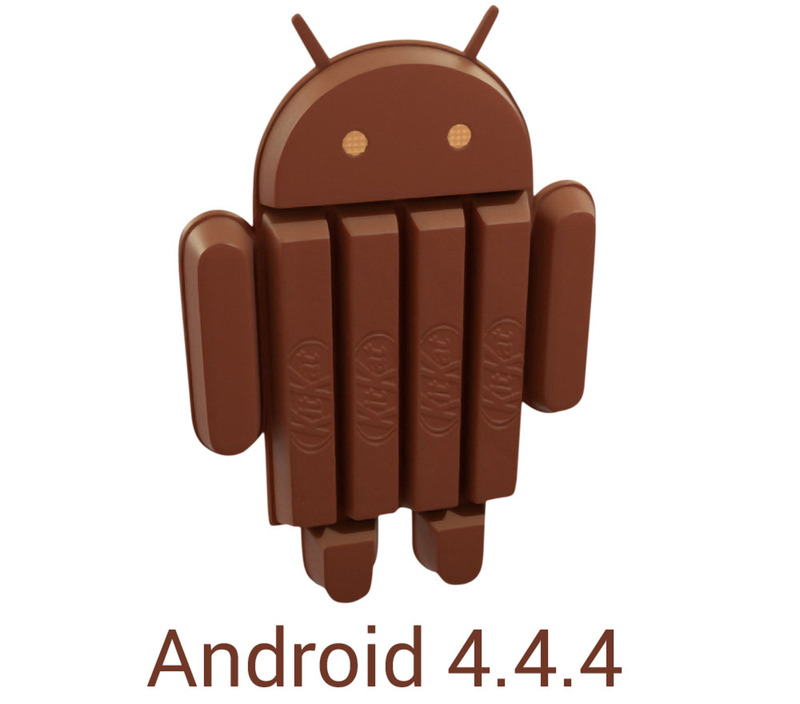 We have a leaked roadmap that shows the Samsung Android 4.4.4 KitKat update schedule, that includes the list of devices that Samsung will seed the 4.4.4 KitKat update to. As the table reveals the 4.4.4 update has already been completed for the Galaxy S5, Galaxy Note 3 (Exynos) and the Galaxy Note 3 (Snapdragon) models. This means the rollout should begin any moment now. The update is in the final stages of testing for the Galaxy S4 (Exynos), Galaxy S4 (Snapdragon) and Galaxy Note 3 Neo. It should kick off in November. 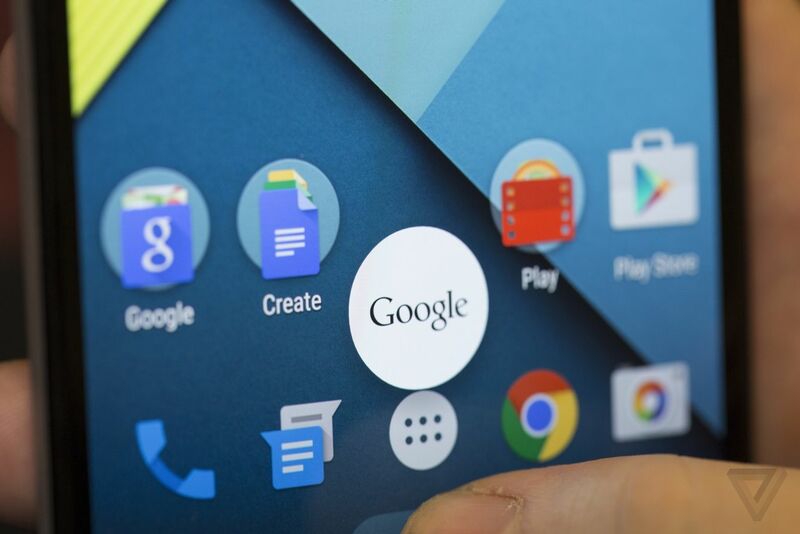 The Android 4.4.4 firmware is in development for another batch of devices and should soon enter the testing trials. 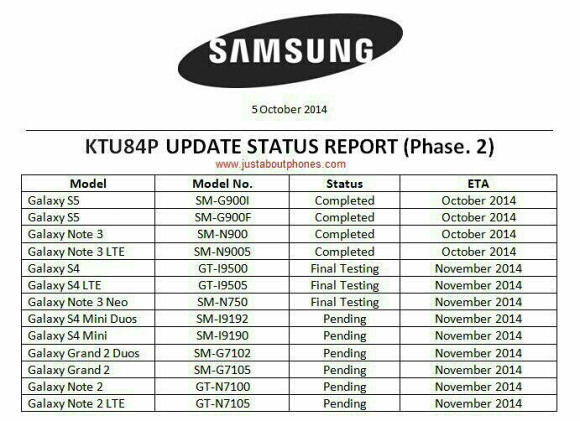 The Galaxy S4 mini and S4 mini Duos, Galaxy Grand 2 and Grand 2 Duos, as well as the Galaxy Note 2 and Note 2 LTE are expected to get the update by the End of November. Samsung is working hard on bringing Android 5.0 Lollipop to all its devices. We got the (Phase 1) official list of the Samsung devices that will be updated to Lollipop. The list shows many of the latest Samsung devices, some are still under development, some awaiting approval. 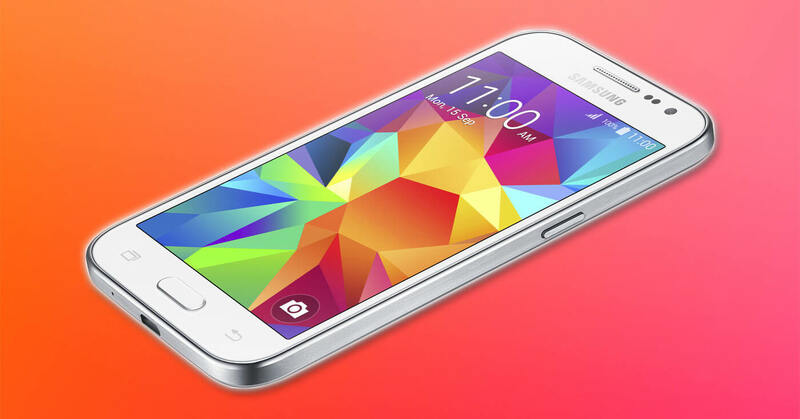 According to reports, Samsung Galaxy S5 will get the Lollipop Update during December,2014. Samsung Galaxy S4 (I9500) will get the same update Early,2015 which will be the first Exynos device to get the Lollipop. The Snapdragon 600 version (I9505) should be getting it sometime later on, the Galaxy S4 Active (I9295) should be getting at the same time since the internals are basically the same. There are also Snapdragon 800 versions - the Galaxy S4 LTE-A (I9506 and some local versions) and the Galaxy S4 Active LTE-A. Those are essentially based on the Galaxy Note 3 with S800 platform (the Note 3 with Exynos uses a different chipset than the I9500). Follow up with us on this List! Many Samsung users around the world are still waiting for their Official Android 5.0 / 5.1 Lollipop Update to hit their devices. We here at YouMobile are trying to keep all those Samsung users updated, that's why we created the Official Updates Status Page to check up on your device's Model update status (Delayed, Rolling-out, Pending, Confirmed... etc). Many of the users who did NOT get the update yet are asking "When my device will get the update ?" or "Any ETA for the Lollipop update ?"... 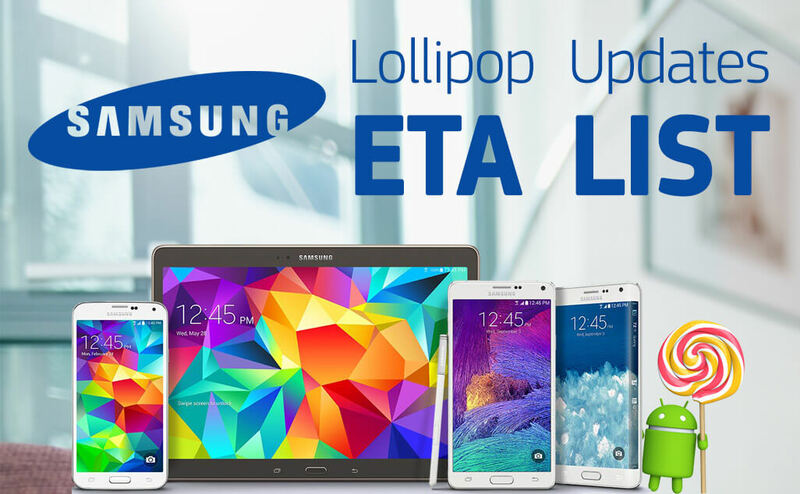 So we decided to post this "ETA (Expected Time of Arrival) List" for the Lollipop update of every Samsung Device That DID NOT get the update yet. Please Note, The dates listed above are only ETA [Expected Time of Arrival] and NOT all of them officially confirmed, the updates may come sooner or later than the dates listed above. We gathered these data according to the Info announced/leaked from Samsung, and also based on monitoring KIES update servers behavior. Samsung has mostly finished updating most of its latest flagship smartphones to the Android 5.0 Lollipop. Now, the Korean giant is looking for its Mid-range devices. Today, We got confirmations regarding the official Android 5.0 Lollipop update for some mid-range devices on the market currently. (Lollipop updates are currently In-development for these devices, no ETA). 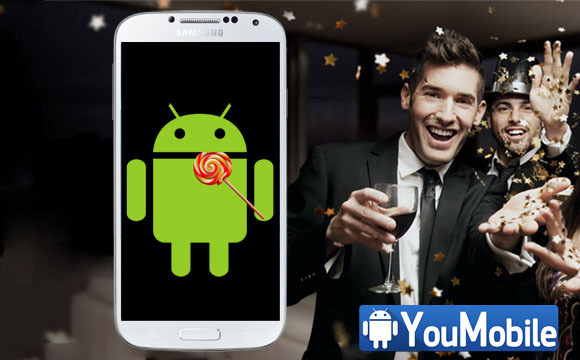 Currently, Galaxy Grand Prime official Android 5.0 Lollipop update is under development, it's expected to start rolling-out by late Q2,2015 (June - July) but this Date is still not confirmed. The update will bring an updated TouchWiz UI with Material design along with some new features. The Galaxy Core Prime official Android 5.0 Lollipop update has already been confirmed before by Verizon, but now we confirm it's coming to the unlocked variant worldwide, probably by the end of this Quarter. The Update will bring a Material Design TouchWiz UI, new lockscreen, new notification menu, bug fixes and performance enhancements. 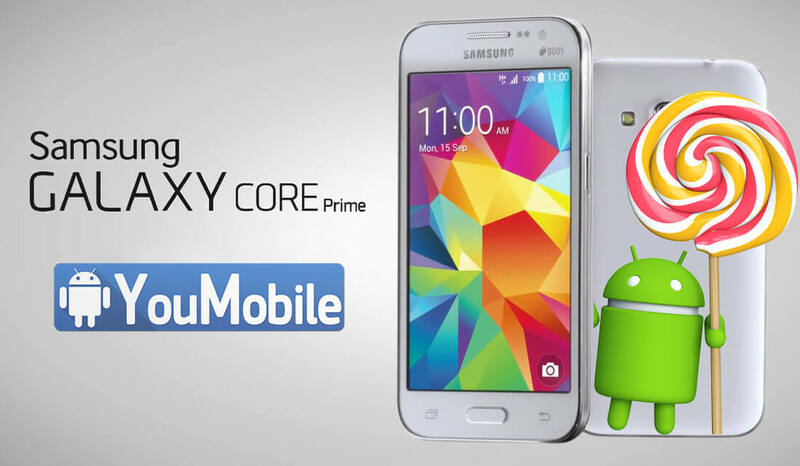 UPDATE: Core Prime Lollipop 5.0.2 is Rolling-out HERE. 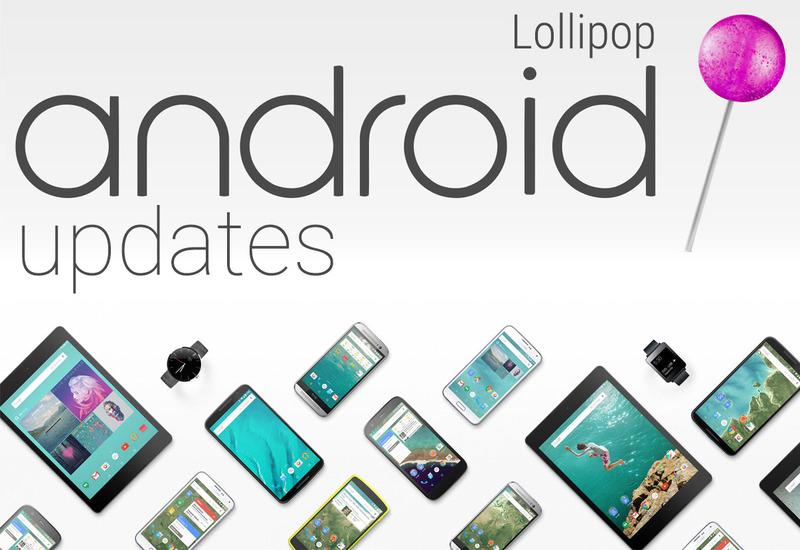 Keep checking the Samsung Official Android Lollipop updates page for latest updates. @yusuf_zohair Hey, the following devices will be getting the Lollipop update : Note3, TabS, S4, S4 Active , Alpha and S5. Only devices included on the list above are confirmed to receive the Official Lollipop update in all Middle-east regions in a timeframe of 1 - 2 months at least. Google has officially annouced the Android 6.0 Marshmallow, currently developer Preview 3 is available for download and the final version will be officially released by the End of Q3,2015. Samsung will start preparing its Marshmallow updates after releasing the Lollipop 5.1.1 updates which are currently Rolling-out for various of its devices with many improvements (Guest Mode, Improved UI, Bug fixes... etc). By early next year, Samsung will start releasing its first Android 6.0 Marshmallow firmware with TouchWiz UI. The Korean giant is always looking to brings the best User Experience to all its users. 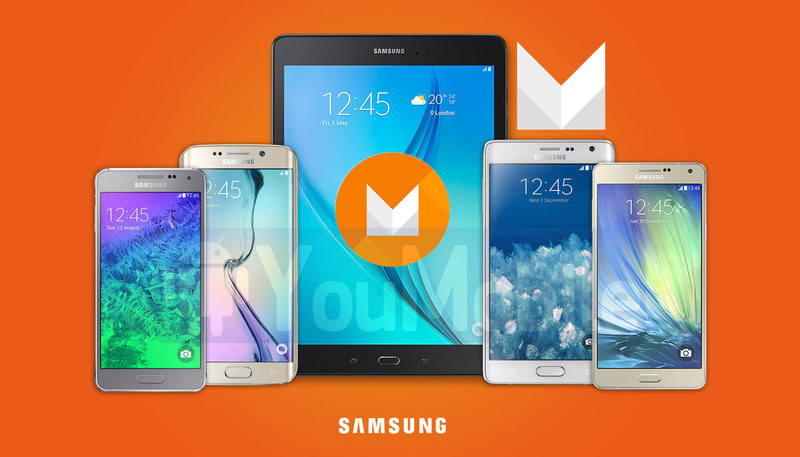 We have the list of the confirmed devices that are planned to get official Samsung Android 6.0 Marshmallow updates. List above has been updated on August,17th with two new devices confirmed to get the Andorid Marshmallow update. 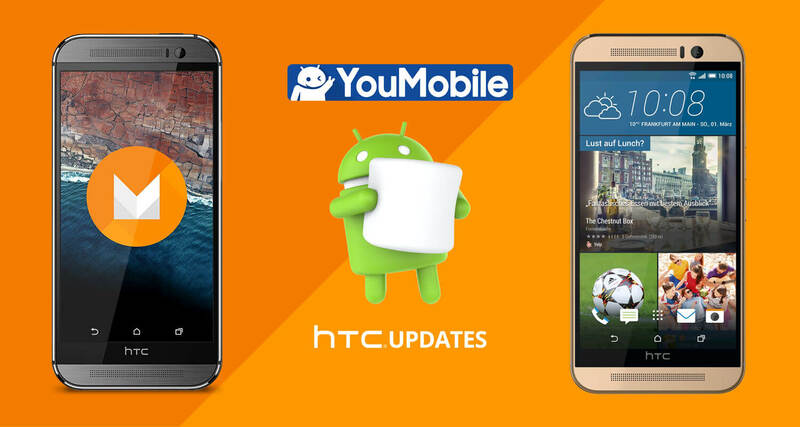 You can check the Full official Change-log to see What's New in Android 6.0 Marshmallow HERE. This is not the final list, other devices will be added to the list, Stay tuned and don't forget to follow Our Samsung Official Updates Page for More Info. 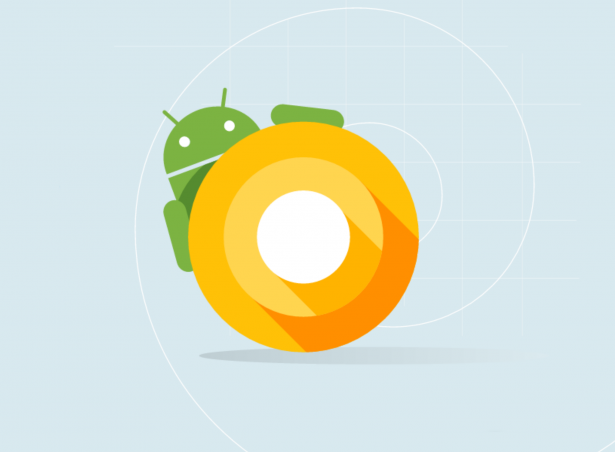 Recently, Google officially annouced its latest Android 6.0 Marshmallow release, currently the developer Preview 3 is available for download and the final version will be officially released by the end of Q3,2015. Samsung will start preparing its "Marshmallow" updates after releasing the Lollipop 5.1.1 updates which are currently rolling-out for various of its devices with many improvements (Guest Mode, Improved UI, Bug fixes... etc). Samsung has already published an Infographic that shows what the company will focus on its upcoming Marshmallow update releases. By early next year, Samsung will start releasing its first Android 6.0 Marshmallow firmware with TouchWiz UI. The Korean giant is always looking to brings the best User Experience to all its users. 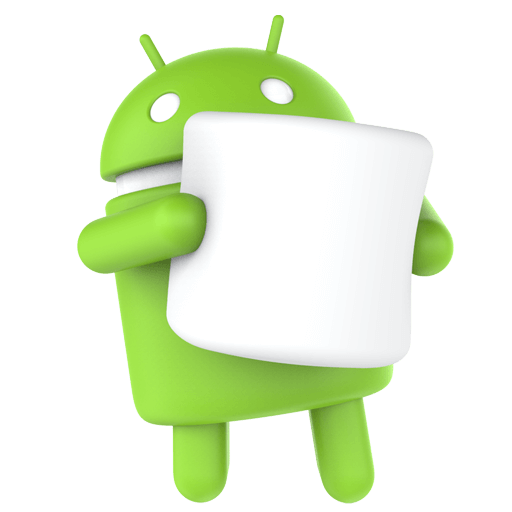 Our insider provided with a the list of the Confirmed devices that are planned to get official Samsung Android 6.0 Marshmallow updates so far... more devices will be added to list as soon as we get more info. Please note that this is not the final list, other devices will be added later, Stay tuned and don't forget to follow our Samsung Official Updates Page for More Info. Lo and Behold! Android 8.0 is here and unsurprisingly, it has been named Oreo; the name that everybody thought it would carry from day one. Those rooting for Oatmeal Cookie will have to be disappointed because Nabisco did one over you all apparently... Now to get to the useful stuff, here is a list of Samsung smartphones which will be getting the Android Oreo update for sure. Keep in mind that list can and will expand in the future as more reports come in and Samsung makes things official, but all smartphones on this list right here are almost 100% assured to get a piece of Oreo in the future. 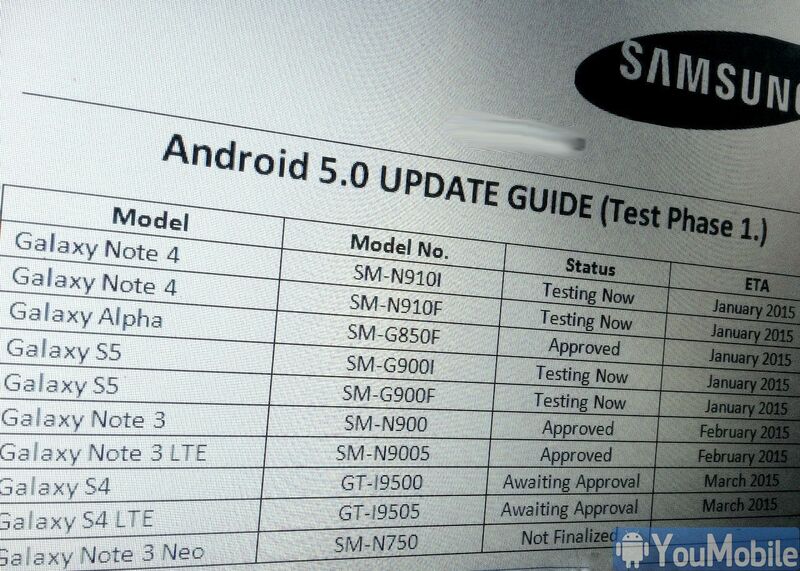 The Galaxy Note 5 and the entire S6 series are also rumored to qualify for the update but that's unsure at this moment. If you were expecting a timeline then we must disappoint you because it's way too early for that. Head over to our firmware section to find all the latest available updates for your Samsung smartphones and tablets. Although even the Galaxy S8 and the S8+ have not had a taste of Android Nougat 7.1.1 yet, thanks to The Android Soul we have a Pretty Comprehensive, but speculative list of Samsung devices that may or may not get the elusive Android 8.0 Oreo update officially. Make no mistake, this is a list built on speculations and educated guesswork, but as far as I can tell, we can expect this list to be at least 80% - 90% correct. Take a look below and see if your device may get the OTA update, when released. If not, it might be a good idea to change to a more recent phone!